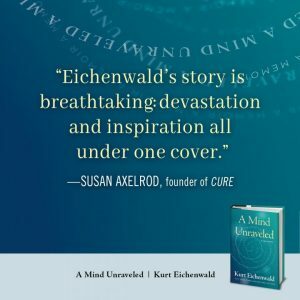 A Mind Unraveled is the compelling story of acclaimed journalist and New York Times bestselling author Kurt Eichenwald’s ongoing struggle with epilepsy—his torturous decision to keep his condition a secret to avoid discrimination, and his ensuing decades-long battle to not only survive, but to thrive. 50% of the royalties from sales of A Mind Unraveled benefit CURE and support our mission of finding a cure for epilepsy, by promoting and funding patient-focused research. A Mind Unraveled is an inspirational story, one that chronicles how Eichenwald, faced often with his own mortality, transformed trauma into a guide for reaching the future he desired. Defying relentless threats to his emotional and physical well-being, he affirmed his decision to never give up, and in the process learned how to rise from the depths of despair to the heights of unimagined success.